This Koh Samui hotel is located by the sea, nestled on the beach a short distance from Coco Splash Waterpark, Silver Beach and Hin Ta and Hin Yai. Nestled on the beach, this Koh Samui resort is within a 10-minute walk of Lamai Beach and Silver Beach. Chaweng Noi Beach is 2.5 mi (4 km) away. 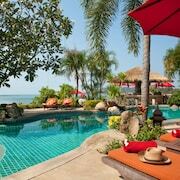 Nestled on the beach, this Koh Samui resort is within 1 mi (2 km) of Escape Break, Lamai Beach and Silver Beach. Chaweng Noi Beach is 3.1 mi (4.9 km) away. 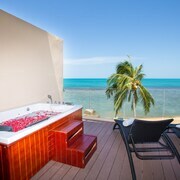 Couples looking to get away will find a romantic atmosphere in Maret, and visitors give high marks for the beaches. Relaxing and cosy, this city also attracts tourists with its spas. Top sights around the area include Namuang Waterfall, Big Buddha Statue and Hin Ta and Hin Yai.